I have had the travel bug as long as I can remember and this probably all started when I took my first trip to Europe at the age of four when my family moved to the UK. This early exposure to travel led me through many paths to today. Having the opportunity to travel to many beautiful places throughout the world, I learned to love the culture and people of the city or country I was in. Seattle is my hometown, and I am a fourth generation Seattleite. I am always amazed by what the city had to offer visitors, and I saw a need to combine a love of photography with travel. This love of travel that with my other passion for photography has helped create one of the premier tour company's in Seattle, Shutter Tours. My personal photography has taken me into many directions including Photo District News Magazine as a winner in the Pro Division of PDN's World in Focus Travel Contest in 2008. Grand Prize winner in 2009 Wells Fargo/Wachovia photo contest. I have also written for Pilot Guides, a travel site better known for their Globetrekker TV series. I was a featured photographer on MyFox networks, 1-hour special produced by Bennett Productions and Ujena TV. Numerous interviews include the Seattle Times, Puget Sound Business Journal, Washington Examiner and television appearances on QFOX13 and Seattle's premier local show, "Evening Magazine." I also am a yearly judge for the Seattle University International Photography competition as well as the National Scholastic Photography competition. Being a family-owned business, we work hard to create the best tour, and I always enjoy meeting our guests and being a tour guide on many of our trips. And that friendly voice on the other end of the phone will likely be me when you give us a call. 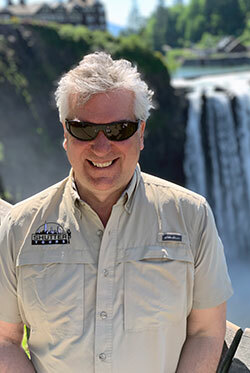 From catching halibut in Alaska to a hot air balloon ride over the Serengeti, I am an adventurer at heart. Traveling has always been a huge part of my life along with taking pictures to document my journeys. 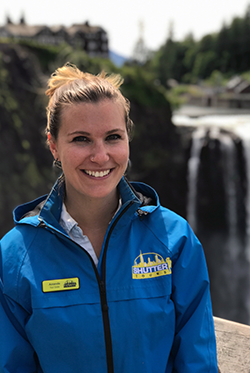 As a Seattle Native and Guide and Manager for Shutter Tours, I get to share Seattle's stories as well as see Seattle through the eyes of a traveler for the first time. Sometimes I even get asked to be in their photos! Through my travels around the world and a most memorable Summer working in a remote fishing Lodge in Alaska, I am excited about meeting new people and sharing their travel experiences. The relationships I get to build with our customers who visit Seattle is priceless and each day is an opportunity to meet people from all over the world. Life is about creating and living experiences that are worth sharing, and I am so lucky to share my love of Seattle with those who choose our company to tour with. I feel as if I am on vacation with our guests and this is the best part of my job. I look forward to being your guide and sharing the best of Seattle with you. Preston recently joined the staff at Shutter Tours and has exceeded our expectations as an outstanding tour guide. 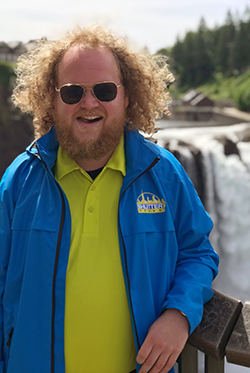 His personal travel experiences of living abroad and working as a Foreign Language Assistant for the French Ministry of Education and a Pre Doctoral Teaching Associate at the University of Washington has allowed him to be a perfect choice for a guide with Shutter Tours.